SALEM, OR -- Governor Kate Brown signed the Redmond Housing bill in to law, Tuesday. House Bill 2336 will allow the city to bring an additional 485 new homes to the east side of town, in a development known as Skyline Village. 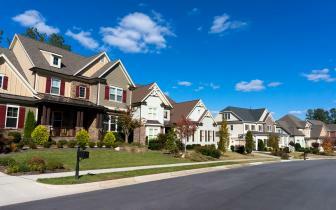 Half of those homes will be deed restricted for low-income households. "As one of the fastest growing cities in the state, Redmond has a severe need of more affordable housing," Rep. Jack Zika (R-Redmond), chief sponsor of the bill, said in a statement, "Our bill will help by adding hundreds of new affordable housing units. 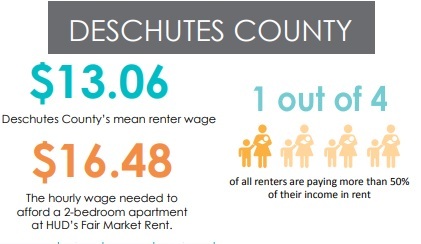 Redmond families are desperate for a place to live that they can afford." 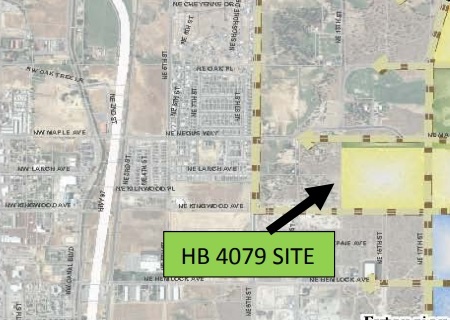 HB 2336 allows Redmond to join a state pilot program created in HB 4079, passed in 2016, intended to expedite development of affordable housing outside urban growth boundaries, by "fast tracking" the land use process. Prior to the bill's passage, only Bend had been approved for the project. 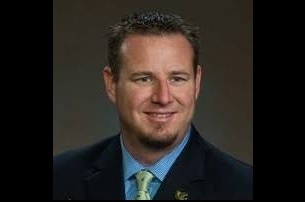 To hear reaction from Redmond City Manager Keith Witcosky, along with an explanation of what's next, click HERE or visit our podcast page. 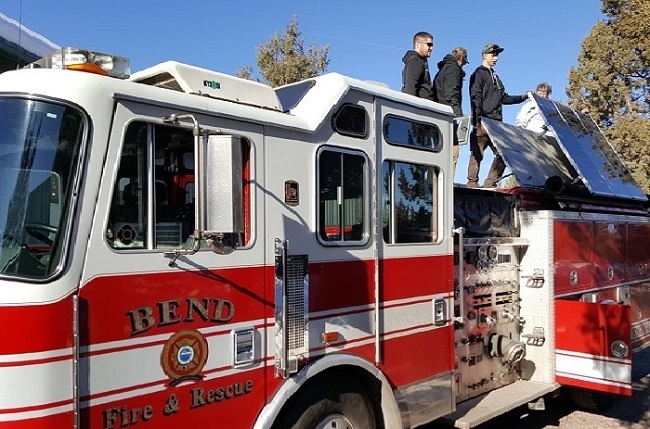 BEND, OR -- The Bend Fire Department has a new mobile education center powered by the sun. Volunteer Coordinator George Fox spearheaded the project to convert a decommissioned fire engine into a resource for fire prevention and safety. Solar panels power its media displays. "We wanted to make this a better operational system. We wanted to make sure it was a prevention device that we can take to anyone and teach any type of prevention message possible. The idea that we can now take this anywhere, and not have to drag a power cord, we can now pull up and have it fully operational and on its own." Fox tells KBND News one of the best things about the community engine is that everyone can check it out, "It's a working operational opportunity for kids to be able to sit on the engine, sit in the driver's seat, sit in back where the firefighters work, and point and look at the gauges and ask questions about how we operate it on the fire ground." He adds, "Anybody that comes up with ADA requirements can now visualize everything that goes on in the cab. We can now turn that program around. And, instead of playing a safety message, it will simulate driving the engine down the street. So they can see what it's like, hear the siren, and hear the radios and see what it's like to drive through traffic." The community engine makes its debut at the Environmental Center Earth Day parade and celebration Saturday. Fox says it's come full circle, as it was at the same event last year when the idea was born. Money for the project was raised over the last year, through a grant and donations. 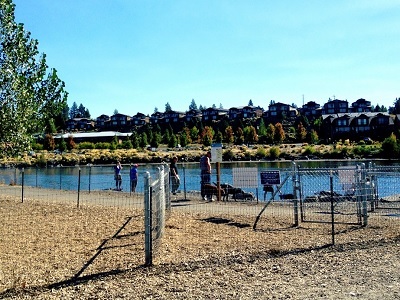 BEND, OR -- U.S. 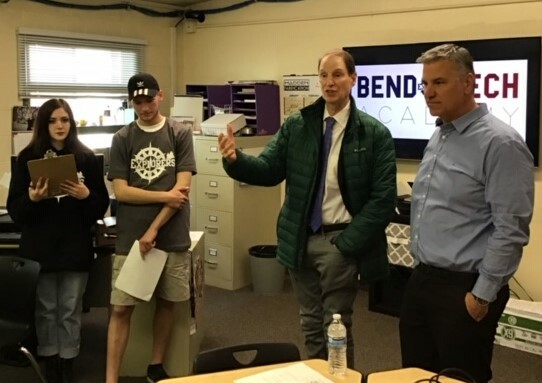 Senator Ron Wyden (D-OR) toured Bend’s Marshall High School, Tuesday, to see how the Every Student Succeeds Act (ESSA), passed in 2015, is helping students prepare for adulthood. "The law stipulates that if a school has a low graduation rate, they’d be in a position to get some extra help for things like mentorship programs. This school says that every senior has a mentor. They’d be eligible to work with companies; this school is doing that." Marshall made a big shift this year, dividing into five academies to provide kids hands-on learning in the areas of engineering, construction, STEM, health occupations or liberal arts. Students talked about how they benefit from smaller classes and personal attention. One student told Wyden the school is, "Preparing kids to have high-wage, high-skill and high demand, real-life jobs. That is what the economy really needs." They also told him they want to shake Marshall's reputation as the school for troubled kids, so it's known as a place they take charge of their education. 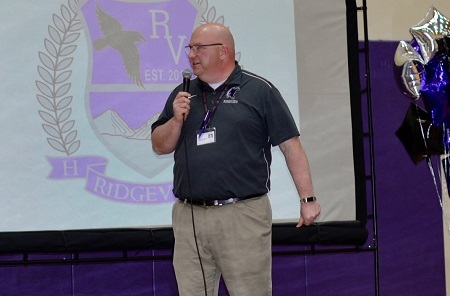 Principal Sal Cassaro is pleased Senator Wyden is taking notice, "It kind of validates that we’re on the right track." Cassaro tells KBND News this year was a soft launch for the five-academy format and he looks forward to pushing full steam ahead, next fall, "Our one thing that we’re going to focus on, from now for as long as we’re all here together at Marshall High School, is building students’ futures [for] when they’re done with high school." 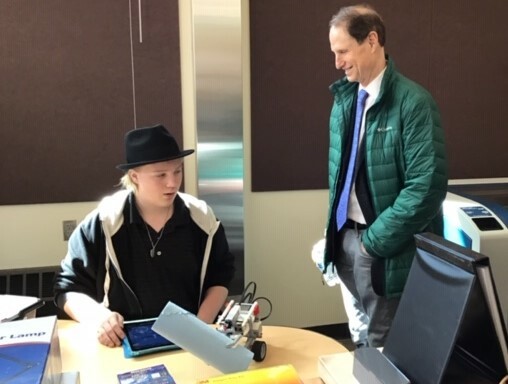 Senator Wyden met with a teacher who told the Oregon Democrat, "I teach a few different things; I teach robotics. I think, unfortunately, robots are going to take a lot of jobs away, so let’s teach these guys to design them, build them, manufacture them and maintain them." 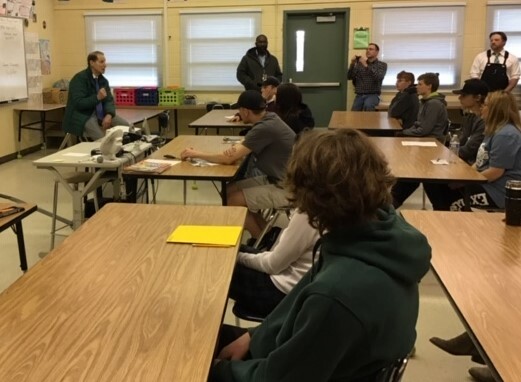 Wyden also visited a construction classroom and fielded questions from a group of students. He told them, "I really feel like now Oregon is headed in the right direction. We’re not going to turn this graduation rate situation around in 15 minutes; but, you guys are on to some really fresh, appealing approaches." 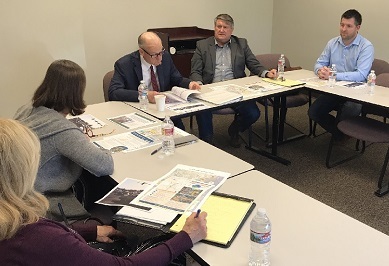 While in Bend Tuesday, he also met with Bend’s Mayor and representatives from several recreation businesses, to talk about how Congress can help the industry. 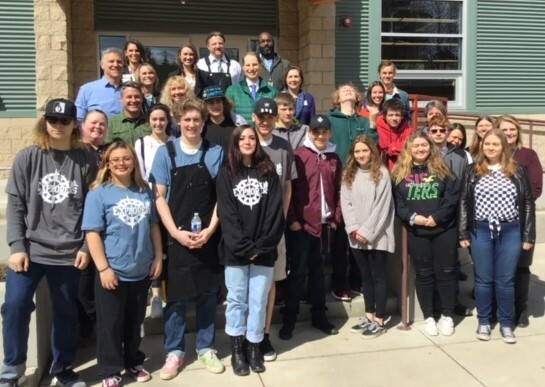 "Recreation is now an enormous economic engine for this area," Wyden says, "But we’ve got some big challenges; in particularly, still, access to capital." He heard from several recreation businesses led by women, who he says have great ideas for the region, but struggle to find investment capital, "This idea that women, who have successful businesses, should have to put everything up - including their house, if it’s their only asset - when men don’t have to do it, isn’t right." Wyden says the discussion could result in legislation, but he wants to see first what can be done administratively to boost the recreation industry. 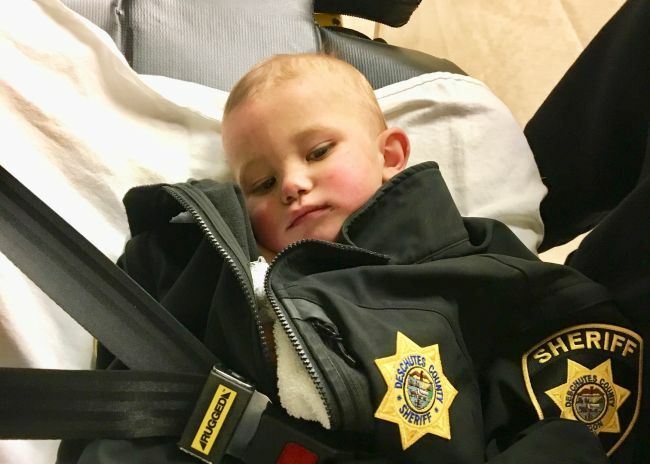 BEND, OR -- The man accused of leaving his one-year-old baby alone in the woods off China Hat Road last year, was sentenced to nearly three years in prison, Tuesday. 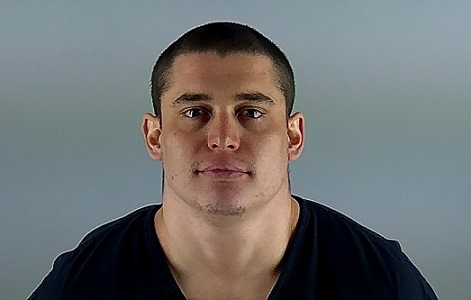 Deschutes County Deputy District Attorney Jason Kropf says Brandon Blouin agreed to a plea deal, "Mr. Blouin pled guilty to counts four, five and six on the indictment. Count four was Endangering a Minor; count five was Criminal Mistreatment in the first degree, and count six was Felon in Possession of Body Armor." Kropf tells KBND News the first three counts on the indictment were dismissed, and Blouin submitted an Alford plea on the last three counts, "It's an acceptance that he's going to be found guilty of those charges, without necessarily saying 'I'm Guilty'." Kropf says the 26-year-old is not allowed any contact with Baby Bradley until he has served his full sentence of 32 months in prison and five years' supervision. "The 'Endangering the Welfare of a Minor,' that's a misdemeanor," says Kropf, "After he serves his time in prison, he'll be what's on post-prison supervision in whatever community he lives in, and part of those conditions being not having contact with the child. So, he's not to have contact with the child for the next five years." Baby Bradley was returned to his custodial grandmother in West Virginia soon after his rescue in May of 2018. Kropf says, "The condition of that probation was to not have contact with the child, the child's grandmother, and the child's mother." Blouin was initially released on bail, but failed to appear for a court hearing. 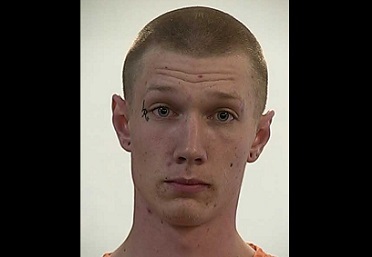 He was re-arrested in November and held at the Deschutes County Jail, where he remains, as of Wednesday morning. 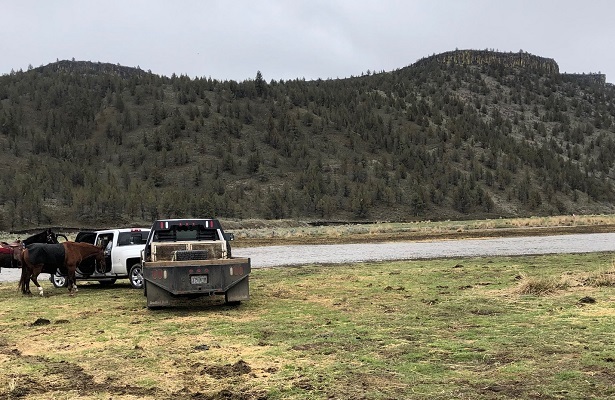 PRINEVILLE, OR -- The Crook County Park and Recreation District recently awarded a construction contract for renovations at the Ochoco Creek Skate Park, and construction is set to begin. Dreamland Skate Park is expected to break ground the first part of May. 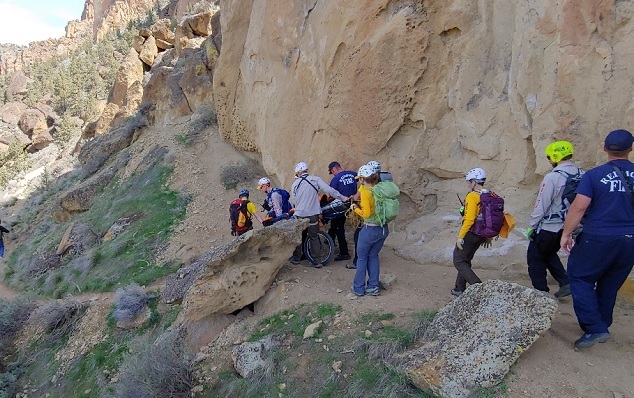 "This whole end of Ochoco Creek Park, we're really focusing on active recreation," says Parks District Executive Director Duane Garner, "We're trying to add some features that lots of different folks will enjoy using and have fun, stay healthy, be active." The park will stay open as long as possible during construction. Garner says the park needs to be refurbished, "There's old metal ramps and there's concrete abutments they attach to. So, all those metal ramps are going to come off. It'll basically stay somewhat of the same design, but the ramps will all be concrete now. It will more than double in size, and so the old and the new will blend together, you'll never even know that they were two separate things." And, he says, it will be unique, "It's going to be a little different than what you see in Bend or Redmond, in that, it will have a bowl - but the site that we're using is close to Ochoco Creek, we can't dig real deep. But there will be a lot of above-ground features and there will be plenty of ramps, and edges, and half-pipes and quarter-pipes, and all kinds of fun things." The final design came from public input. Garner says, in addition to revamping the skate park, there are plans to refurbish the nearby tennis courts for pickleball, and expand off-street parking and safety features. The project comes with a $430,000 price tag, 60% of which came from a local government grant awarded by the state; the rest is coming from the Parks and Rec District. Construction of the skate park is expected to be complete by the end of August. 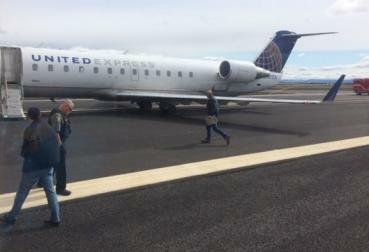 REDMOND, OR -- Redmond Mayor George Endicott is on his way to Washington, D.C. to meet with members of the Trump Administration. Endicott tells KBND News they'll discuss Opportunity Zones, which were created in the 2017 tax reform bill. "I’ve been invited, I was told, because Redmond has some success stories in that area. We currently have two major efforts underway in Redmond that have taken advantage of the Opportunity Zone. One, is the old hotel." 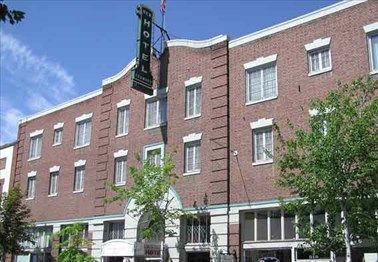 He says renovations at the historic New Redmond Hotel are moving forward because of the program, "The developer, there, needed additional funding just about the time this Opportunity Zone idea came up. And so, he’s got additional investors to help him finish the hotel project." A 128-townhome project on the south end of Redmond, known as The 21 Canal, is also benefiting from an Opportunity Zone designation, "These projects might not have happened but for the opportunity zone concept to come into play." Opportunity Zones allow investors to receive tax breaks when they reinvest capital gains in to qualifying properties; it's designed to revitalize under-served areas. Endicott expects to talk with the Secretaries of Treasury and Housing and Urban Development, among other officials, during the Wednesday meeting, "There are about 8,400 opportunity zones around the United States and they’ve apparently, as I understand, invited about 150 people to attend." 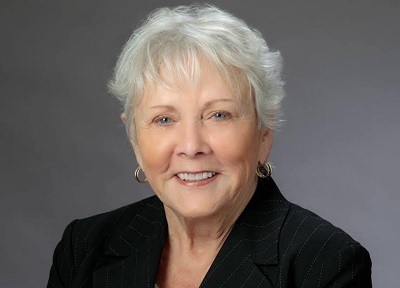 SALEM, OR -- Oregon Secretary of State Bev Clarno has appointed Bend State Representative Cheri Helt to the State Board of Education, as the Secretary’s designee. 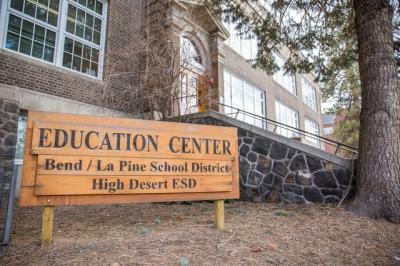 Clarno cited Helt’s eight years on the Bend-La Pine School Board and professional experience as qualifications for the appointment. Clarno's office released a statement saying, "Representative Helt is a working mother with three children and is a business owner. She was elected three times to the Bend-La Pine School Board. During her service, high school graduation rates in the district rose 10%. She championed instructional technology to replace outdated textbooks and collaborated with teachers and administrators to create a performance-based compensation system." 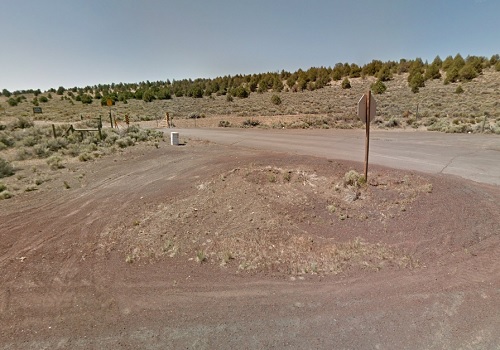 BEND, OR -- Congressman Greg Walden says he’s supporting a grant request by the Oregon Department of Transportation, to help fund the realignment of Highway 97 at Cooley Road, on the north end of Bend. "We know you’ve got 30,000 Bendites driving to Redmond, and vice versa, every day; and then, another 20,000 visitors coming in the summer, every day," Walden tells KBND News, "And we just don’t have the capacity anymore, on the existing system." He met Monday with city and county leaders, as well as ODOT, to discuss the project. ODOT Regional Manager Gary Farnsworth says it’s Region Four’s top priority. "It’s the key, really, for long term, in this area, when it comes to transportation. It really reflects a lot of what’s happening here and where we need to stay, in terms of keeping up." Farnsworth told Rep. Walden state and local governments have already committed funding. "To see this much investment commitment by the local jurisdictions speaks volumes to the relative need, from both the county and the city, and even private sector. And, I can tell you, there is a lot waiting in the wings from the private sector perspective that would want to contribute into this to make it work." Bend Mayor Sally Russell told him the project is long overdue, "That information has been out and has been through the public process for such an extended period of time, so it’s more about waiting and knowing it’s going to happen, and sort of the ‘when?’ question." City Councilor Justin Livingston and County Commissioners Patti Adair and Phil Henderson also took part in the meeting. Walden says it was important for him to fully understand why the project is so necessary to address congestion, "So that I can articulate this better to the Department of Transportation at every level, including at the secretary level, to explain why this is such a priority." 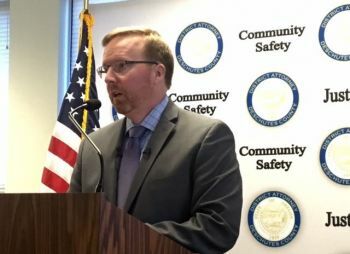 If ODOT doesn’t get the $67 million INFRA grant from the U.S. Department of Transportation, Farnsworth says the project could still move forward with money already secured from state and local governments. But, he tells KBND News, it would happen much more slowly and in more phases. This is ODOT's second attempt at securing federal funding for the project. Because environmental impact studies are already complete, he says the project would take about two years, once its fully funded. 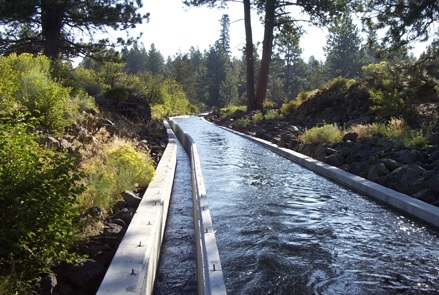 BEND, OR -- Another Central Oregon irrigation district is receiving federal funding to pipe open canals, in an effort to conserve water. The Swalley Irrigation District has already piped 45% of its canals; this influx of $11.2 million will allow for piping the remainder. The district’s watershed plan and environmental assessment was recently approved by the NRCS, allowing the work to move forward. U.S. Senator Jeff Merkley helped secure the money from the 150-million dollar Watershed Protection and Flood Prevention Program. 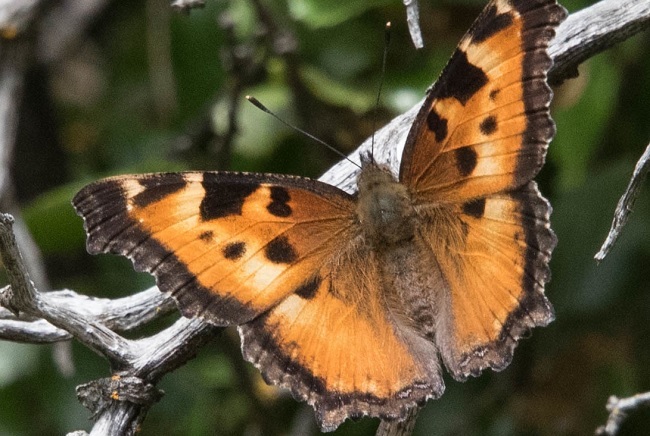 "It started several years ago, when I heard that several folks on the Appropriations Committee were seeking to design a strategy for helping irrigation districts that have endangered species issues. And, I said, ‘wow; that’s us in Oregon.’ So, since that time, I’ve been able to get half that funding to our state." 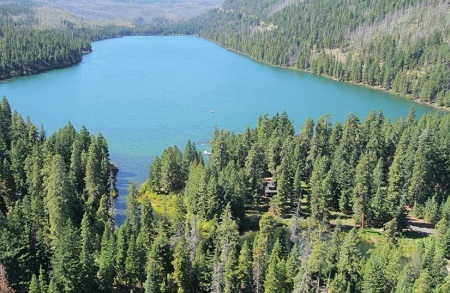 Of the $75 million available to Oregon, $30 million went to Tumalo Irrigation and $11.2 million was just awarded to Swalley. Merkley helped celebrate Tumalo Irrigation’s new piping project, last month. Senator Merkley says bringing the program to the High Desert started with an idea from Central Oregon and North Unit irrigation districts. "They were pondering how they could proceed with piping in their areas and get more water into the Deschutes. As it’s turned out, Tumalo and Swalley got through the process more quickly." He tells KBND News the Klamath Basin may eventually take advantage of the program. But, so far, the money has exclusively come to Central Oregon. Swalley will use the money to pipe more than 16 miles of open canal over the next seven years. 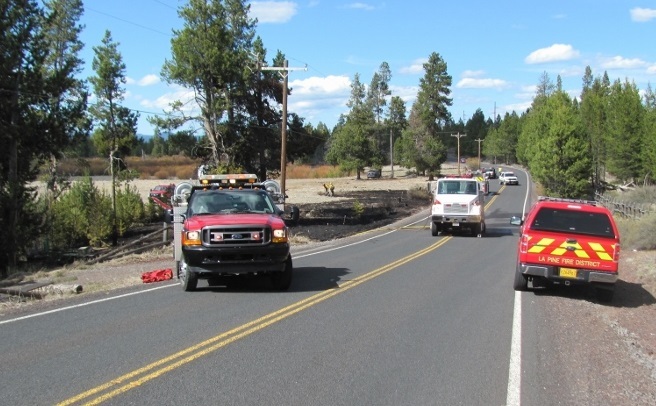 The 16,000' Rogers Lateral Piping project (pictured), on the north end of Bend, is expected to be the first phase. it should be complete early next year. 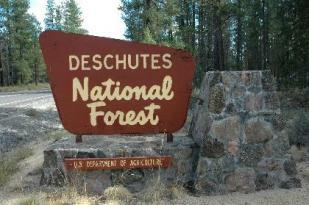 SISTERS, OR -- U.S. Forest Service crews are marking trees along Highway 20, west of Sisters, starting Monday. Officials say they're in danger of falling and need to be removed. Planning for the tree removal project began a year ago. The most dangerous trees were brought down last fall. Thousands of trees were compromised by exposure to the herbicide Perspective, several years ago. ODOT officials say 2,100 trees will be removed within a 150-food wide path on both sides of the highway, to protect drivers. Most will be used as wood products; some will be cut and left in place to provide wildlife habitat. The project should be done by late May. 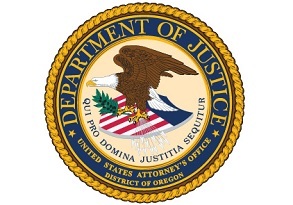 MADRAS, OR -- A former Madras Police officer was sentenced Thursday to six years in federal prison for the repeated sexual abuse of a minor. 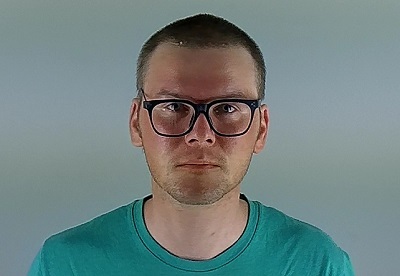 According to the US Attorney’s Office, the investigation into 35-year-old John Wallace, Jr. began in January 2018 when the victim and her mother contacted Warm Springs Police to report the abuse. Investigators say it took place over several years at his home on the reservation and on a separate occasion in Madras. According to the Madras Pioneer, Wallace worked for Warm Springs Police prior to being hired by Madras PD in 2015. He was put on leave when the investigation began in January 2018, and fired a few months later. 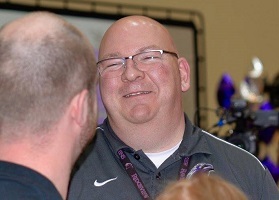 Wallace pleaded guilty on January 3, 2019, to three counts of abusive sexual contact with a minor. In a related state matter, a Jefferson County judge found him guilty of attempted sexual abuse in the first degree and official misconduct in the first degree. He'll be sentenced Friday on those counts. After prison, Wallace will serve a life term of supervised release. PORTLAND, OR -- There were 15 youth suicides reported in Central Oregon in 2017, and Bend State Representative Cheri Helt believes it’s a crisis that has solutions. She's supporting a bill creating a statewide School Safety and Prevention System to help school districts combat bullying and harassment, prevent suicide and promote student wellness. 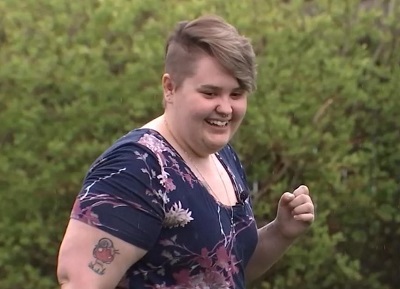 "It’s getting a lot of support," she told KATU's Steve Dunn on Sunday, "We need to make sure that we implement solutions that are going to work and this is a solution that they’ve looked into; it’s had a lot of eyes on it." She adds, "I sat on the school board and every time we lost a student, it is very personal and it is a very difficult thing, and it is preventable. As a community and as a state, we need to come together and prevent suicides from happening, and it’s a conversation that we have to have." But, Helt says new legislation is just one approach, "We really need to be looking at our staffing ratios, as well." 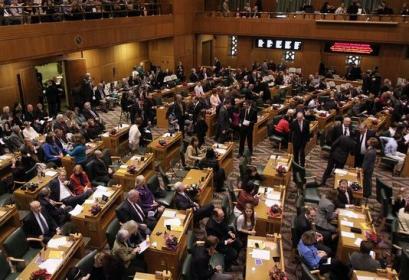 The Bend Republican says, "For years, in Oregon, we’ve been cutting staff and the crux of the problem is we don’t have enough teachers, we don’t have enough counselors and we don’t have enough people in our buildings. So, it’s also going to take adding back staff. We have not recovered from the recession in Oregon, in our schools, and we have to make sure that we change that trajectory." Click HERE to watch Steve Dunn's full interview with Rep. Cheri Helt (R-Bend). 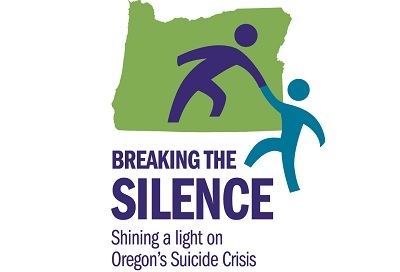 All this week, KBND and newsrooms across Oregon are shining a light on issues surrounding suicide, and possible solutions. For more "Breaking the Silence" stories, visit BreakingTheSilenceOR.com. REDMOND, OR -- Direct flights between Redmond and Las Vegas return this fall. "Truthfully, the Central Oregon Air Service Team and airport staff and city staff have really been hearing what customers want," says Redmond Airport Director Zach Bass, "And, the top thing we’ve heard for years is, ‘we want a direct to Vegas.’ We’ve tried our best, over the years, to make that happen and it currently has with Sun Country, coming in in September." Sun Country Airlines is a discount carrier based in Minneapolis, operating in 54 airports. 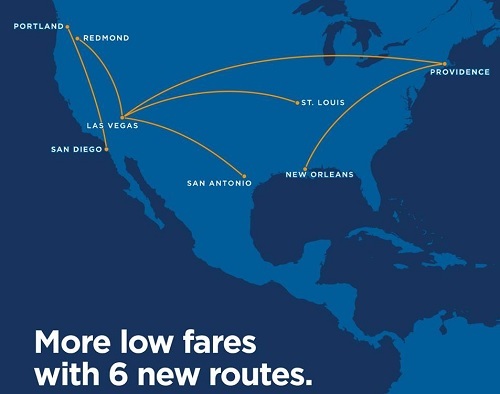 They announced a total of six new routes, including Redmond to Las Vegas, Monday. Allegiant Air offered nonstop flights from Redmond to Vegas for five years. But, they halted the service in the spring of 2012 and pulled out of Redmond altogether a few months later. Sun Country is the first new carrier to come to Roberts Field since Allegiant, "They [Sun Country] are smaller than some of the main airlines, but they run 95 routes," Bass tells KBND News, "They’re running newer 737-700s and 800s; they have a great reputation. In Oregon, they run out of Portland but we’ll be the first airport outside of Portland that has them." 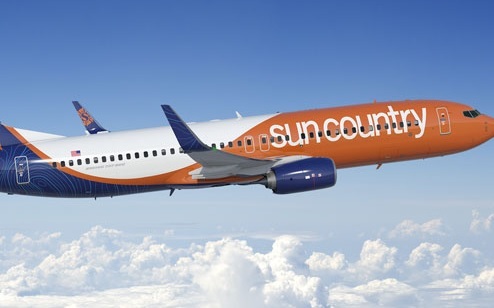 Tickets are now available for the new Sun Country Service, which will run Thursdays and Sundays, "They will be starting September fifth to the middle of December. So, it will be seasonal to begin with. Like we’ve seen with Chicago, starting in June, we’re hoping that, as it’s used and it shows it’s profitable for the airlines, they’ll keep it year-round." MADRAS, OR -- Managers of the Madras Warming Shelter are looking back on the long winter. "We had a total of 116 nights open, which are 100 more than we projected," says Director Pat Abernathy. "We had a total of 1,458 dinners, plus we also did breakfasts and brown bag lunches each day for our guests. 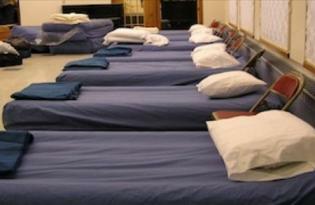 The total guest nights were 1,164, that means how many beds we filled in the five month period that we were open." Abernathy says she most celebrates the contributions to the greater community, "We have the guests that secured a job: 16 people; and 19 went into rehab or into housing. We feel like we changed the culture of Jefferson County by loving these people." And, she tells KBND News, they saved lives, "We had six people at once get pneumonia, and this was during the really bad cold storms that we had in February. Thankfully, we had been feeding these people for two months and giving them a warm place to sleep. Had we not been, I think we probably would've lost some of them this year." The winter shelter rotates between several different churches. It's a joint operation between the Jefferson County Faith Based Network, Shepherd's House Ministries, and Madras Gospel Mission. Abernathy will update the Madras City Council on the season and the shelter's progress, at Tuesday evening's Council meeting. 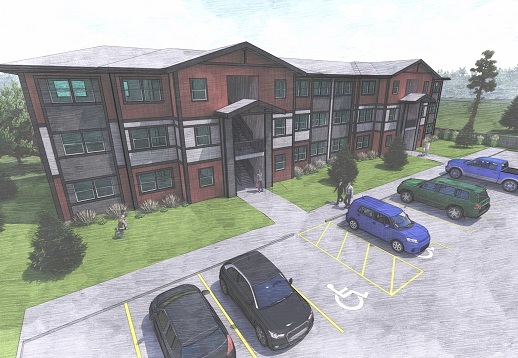 SALEM, OR -- A bill to allow the creation of more affordable housing in Redmond passed the state Senate Monday on a unanimous vote, and is now ready for the Governor’s signature. It would allow the city to take part in a pilot program intended to expedite development of affordable housing outside Urban Growth Boundaries. The bill’s chief sponsor, State Representative Jack Zika (R-Redmond), says it will bring an additional 485 homes to his city, half would be designated for low-income families. Skyline Village would be built on the eastern edge of Redmond. Zika says at least seven developers have already expressed interest in the project. 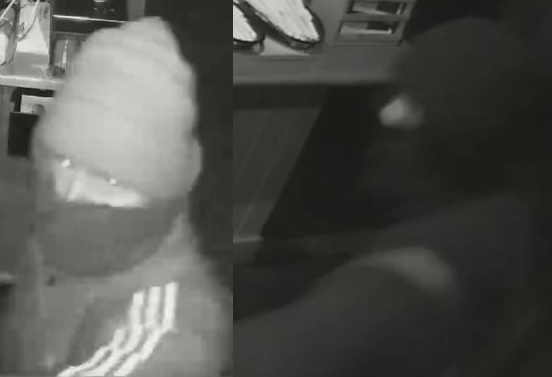 LA PINE, OR -- Two burglars made off with the safe from a La Pine sports bar, early Monday morning. 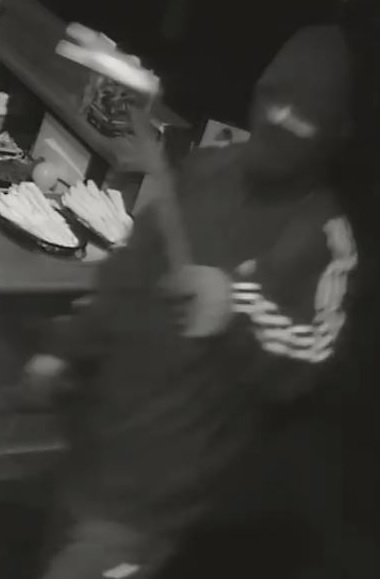 Detectives with the Sheriff’s Office recovered video surveillance that shows two people force their way in to the Wickiup Station Sports Pub just after 4 a.m., remove the safe and take off. Both were wearing all black; one had white stripes on the sleeves of the jacket. They had backpacks and wore masks and caps to hide their faces. The Sheriff's Office asks anyone with video surveillance in the area around the pub and Drafter Road to review footage for any people or vehicles seen between 3 and 5 a.m. Monday. 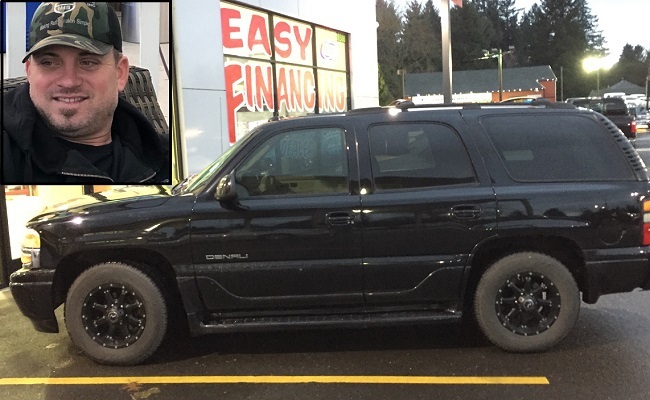 Anyone with information in the case is asked to call non-emergency dispatch at 541-693-6911. BEND, OR -- Central Oregon received record snowfall in February. "It kind of brought the season's worth of snow and precipitation in that one short month to catch up the snowpack to near normal," says Julie Koeberle, Hydrologist with the Natural Resources Conservation Service. 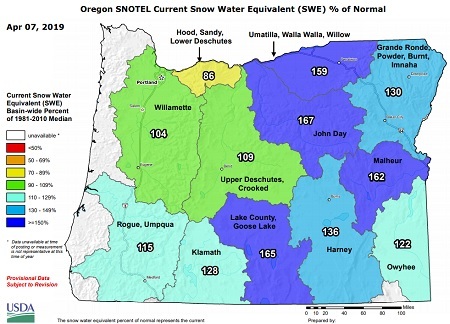 But March was drier than normal, "The Upper Deschutes and Crooked River Basins, if you look at all of our weather stations in the area grouped together, it's only 54% of average for the amount of precipitation in March." While, that decline in precipitation could have caused concern, Koeberle says, "The snowpack, in and around the basin, is really in good shape." 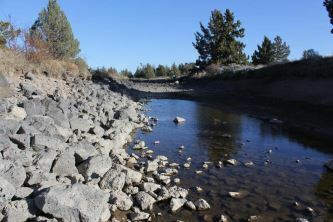 On Friday, she told KBND News, "There's a lot of variability, of course, but if you lump all of our sites together in the Upper Deschutes and the Crooked basin today, it's at 107% of normal for snowpack, so in good shape." In fact, due to weekend storms, the Upper Deschutes Basin bumped up to 109% of normal on Monday. However, Koeberle says the long-term forecast calls for a drier than average summer, which could deplete the snowpack too quickly, "A lot of times, when we have these long-term outlooks, you could still get a really cold storm or a really wet storm." She says, if that happens, the region should still have enough water for summer, "When we're talking about a climate outlook that's now calling for warmer and drier conditions for the next three months, you can still get some of these short-term wet storms." 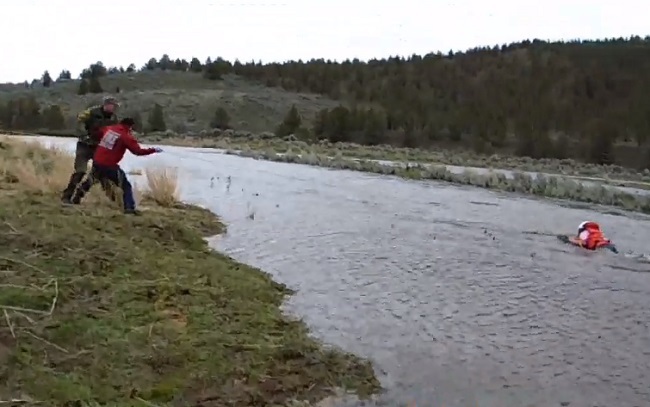 Snowpack is important for maintaining adequate stream flows for fish and reservoir levels for summer irrigation. 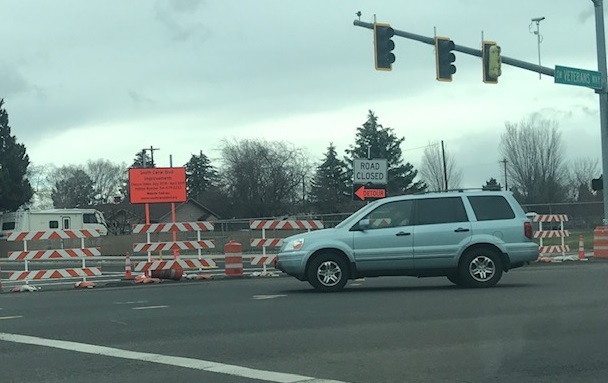 REDMOND, OR -- Work on Redmond’s South Canal Boulevard is in the home stretch, after a one-year closure. City Engineer Mike Caccavano says crews have finished sidewalks and, this week, they’ll install signs and mailboxes, and work on grading the base rock for pavement. "The week of the 15th is paving. As long as it doesn’t rain all week, they’ll get it paved; striping at the end of the week, and then opening probably late afternoon on Friday, the 19th." But don't expect any pomp and circumstance, "That is one of our things here in Engineering, we’re like, ‘okay, we’re done with that one; let’s move on to the next.’ We don’t often take the time to celebrate." He says the stretch of road from Veterans Way to Yew Avenue is a vast improvement over what Canal Boulevard was before, "There was a roadway, but it was substandard pavement and it didn’t have the turn lanes. So, that was the original motivation for the project, bring it up to our standard." 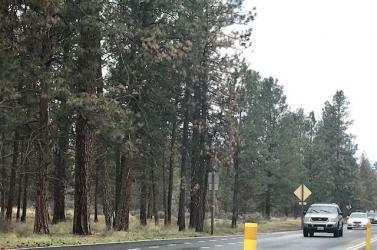 After planning for the project began, it became an even higher priority because of its location, "The importance of it as an alternative to 97, particularly with the pretty significant increase we’ve seen all along 97, from Madras through Bend - I think the realization of how important it is has increased." And, he tells KBND News, it was important to improve the street, if and when ODOT takes on a proposed redesign of South Highway 97, which could send even more cars on to SW Canal. When the rest of Canal reopens, next week, one intersection will remain closed. 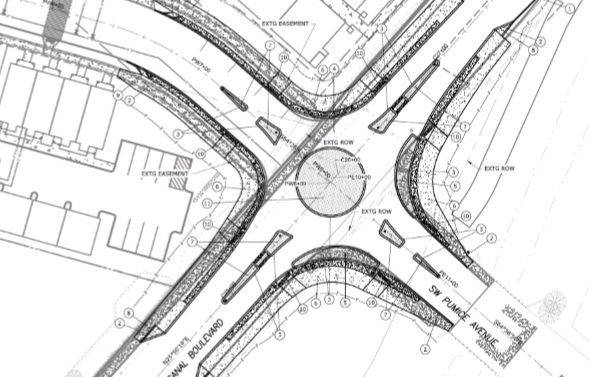 Caccavano expects construction of a new roundabout at Canal and Pumice will begin by early summer, "The intent is to get it done before school starts. And, it would just effect that one intersection. But, we’re really working hard, trying to come up with an option that at least maintains one-way traffic." Caccavano acknowledges the delay is an inconvenience, but says it’s needed to handle increased traffic volumes expected by an apartment complex planned for nearby. While the main South Canal Boulevard reconstruction project came in on time and just about 1% over budget, at nearly $7 million, the small roundabout adds another estimated half million dollars. PRINEVILLE, OR -- Crook County families pay more for food, per person, than almost anywhere else in the country, according to Feeding America, partly because residents are spread out and have few grocery store options. But a new pilot program could help. 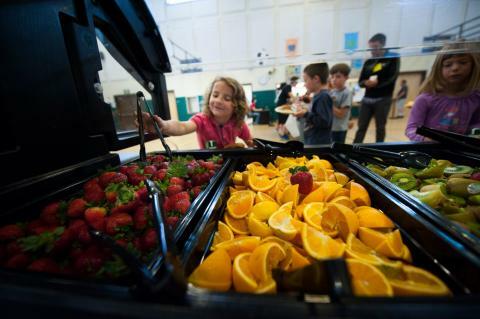 "In Central Oregon, food access is difficult and we’re, as a region, really spread out," says High Desert Food and Farm Alliance Director Katrina Van Dis, "So, the idea was to create a mobile unit where fresh food and food pantry items could be delivered." She says grants are helping to fund the new “Fresh To You" mobile food truck, in cooperation with NeighborImpact's food bank program. "We're partnering, right now, with Mosaic Medical, and we’re going to park it there at an established date and time. And then, all three organizations are going to try and get the word out to people about coming to the mobile unit." She tells KBND News low-income families will be able to choose which items they want or need, once or twice a month, at the Prineville clinic (375 NW Beaver St.). The refrigerated truck will be loaded at NeighborImpact’s main office in Redmond, "The food is going to be grown by local farmers and we’re contracting with farmers to grow specifically for this project." Van Dis adds, "The idea was to partner between our organizations because the food bank and High Desert Food and Farm Alliance are both interested in accessibility to fresh, local food and coupling that with pantry staple items." 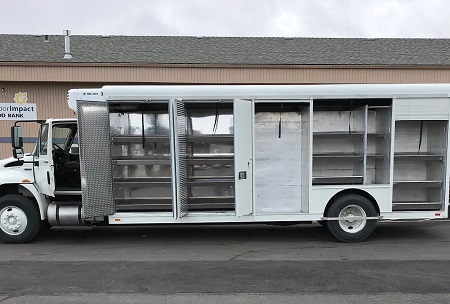 The Fresh To You mobile food truck is nearly ready to go, but Van Dis says it won't start delivering fresh produce until June, due to Central Oregon's growing season. 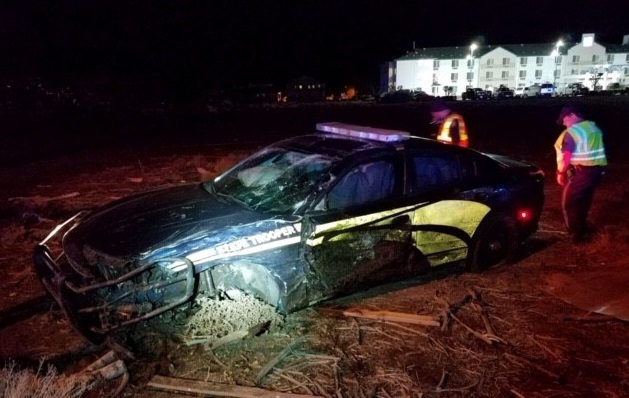 BEND, OR -- A 40-year-old Alfalfa woman is accused of driving drunk and distracted after crashing into a parked car in northeast Bend, over the weekend. According to the Sheriff’s Office, Angela Harley was eating a burrito at about 12:30 a.m., Saturday, when she lost control of her Subaru on Locksley Drive and drove on the sidewalk before returning to the road and crashing into a BMW. No one was in the parked car and Harley was not hurt, but both cars were significantly damaged. 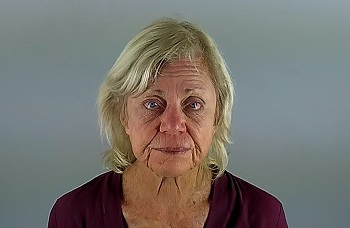 She’s one of six people charged with DUII in Deschutes County, over the weekend. 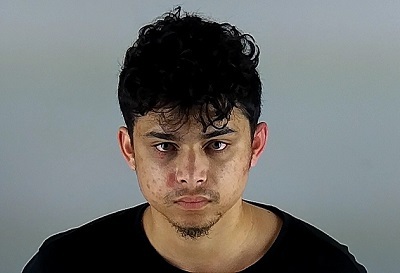 BEND, OR -- A 20-year-old Bend man is accused of breaking in to the Bi-Mart on NE 2nd Street, and stealing medications from the pharmacy. 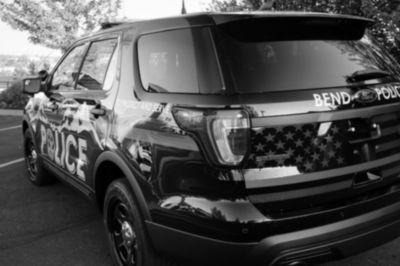 Bend Police say officers responded to a burglary alarm at the store at about 2 a.m. Saturday. When they arrived, they found glass broken out of the front door, then saw a man walking out with a backpack. They say Daniel Shumney's backpack was full of stolen medication. He reportedly failed to comply with officers' commands and was taken in to custody with the help fo K-9 officer "Kim." Shumney is charged with Burglary, Theft and Criminal Mischief. 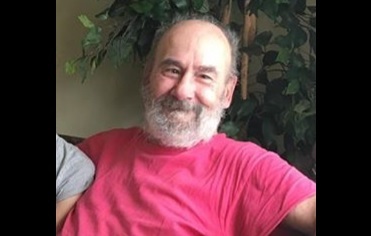 UPDATE: A friend of Gagatko's notified the Sheriff's Office at about 6:40 a.m. Monday to report she'd been in contact with the missing woman. 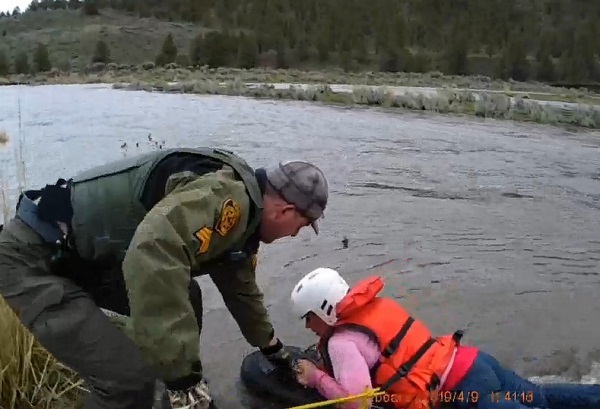 Just after 7 a.m. a Deputy located her and confirmed she is alive and well. 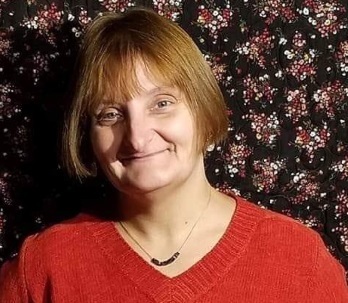 BEND, OR -- The Deschutes County Sheriff’s Office is asking for the public’s help finding a 43-year-old Bend woman who hasn’t been seen since leaving work Thursday night. Katrina Gagatko was reported missing Saturday, after she missed her next shift at Mt. Bachelor Assisted Living. According to her roommate, Gagatko left work at 10 p.m. and said she was going to meet a friend in Sisters. She has since turned off her cell phone. Gagatko is white, 5’3”, about 150 pounds, with blonde hair and blue eyes, and may be wearing a black zip-up jacket, blue polo shirt, black scrub-style pants and blue Nike shoes. 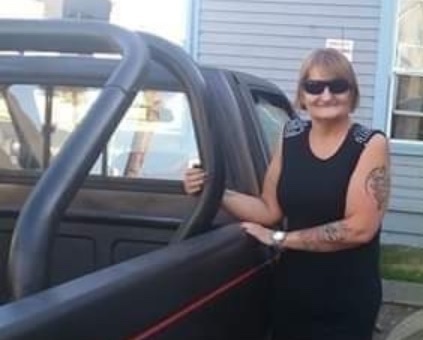 She was last seen driving her 1988 GMC single-cab Sonoma pickup (pictured); it’s black with red pin striping, and equipped with a black roll bar and flood lights. 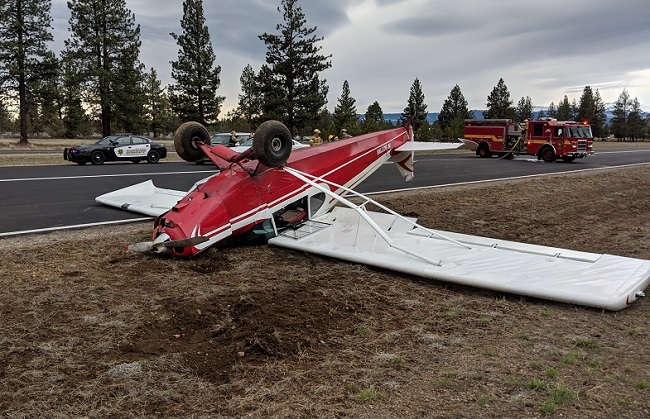 Anyone with information is asked to call non-emergency dispatch at 541-693-6911. 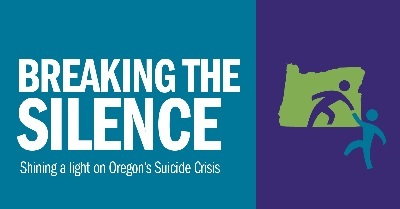 BEND, OR -- Over the next week, newsrooms across Oregon will highlight the public health crisis of death by suicide in our state. The goal of this unprecedented collaboration is to not only put a spotlight on a problem that claimed the lives of more than 800 people last year, but also examine research into how prevention can, and does, work. And, we want to offer our listeners resources to help if they, or those they know, are in crisis. KBND News is proud to take part in this broad effort and will air stories from other news outlets to provide a larger statewide context. While we aren't able to broadcast every story produced by various media, you can find them at BreakingTheSilenceOR.com. One reason journalists tend to shy away from reporting on individual suicides, except in rare circumstances, is the worry that attention could cause a "contagion effect" or cause harm to surviving friends and family. This collaborative reporting project stemmed from a conversation about media coverage of suicide, facilitated by Lines for Life, a regional non-profit focused on suicide prevention. The week-long project recognizes that our silence, while well-intended, does not serve anyone. We can and should do better at addressing this issue, just as we would any public health emergency. Reporting from each newsroom is independent, guided by local editors and best-suited for their local communities. However, we all hope that by working collaboratively and promoting each other's work, this group effort will allow us to shine a brighter light on this problem. KBND News begins its coverage Monday morning, April 8, with a look at the unique challenges faced by our rural communities and the resources available to help. BEND, OR -- Several Forest Service gates west of Bend will remain closed until conditions improve. 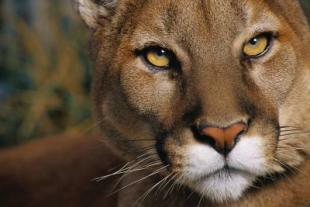 The gates prevent motorized vehicles from entering critical wildlife habitat, between December and March. But, officials say the late-season snow and wet conditions necessitate a delay to protect resources. The three gates are across from Widgi Creek Golf Course, at the Forest Road 4604 and 4610 junction, and the gate just past Phil’s Trailhead on FS Rd 4604. The Forest Service plans to open the gates to vehicles when forest roads are clear of snow and dry. They're open to bikes and pedestrians, year-round. 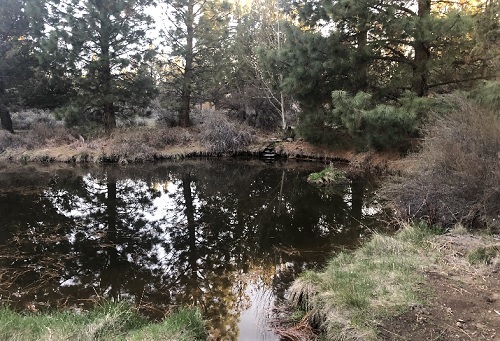 BEND, OR -- The Arnold Irrigation District plans to convert its open-ditch irrigation canals on the south end of Bend to an underground, closed-pipe system, in the latest irrigation modernization project in Central Oregon. Officials estimate it will reduce water loss through seepage, at a rate of 45.1-cubic feet per second, throughout the entire irrigation season. 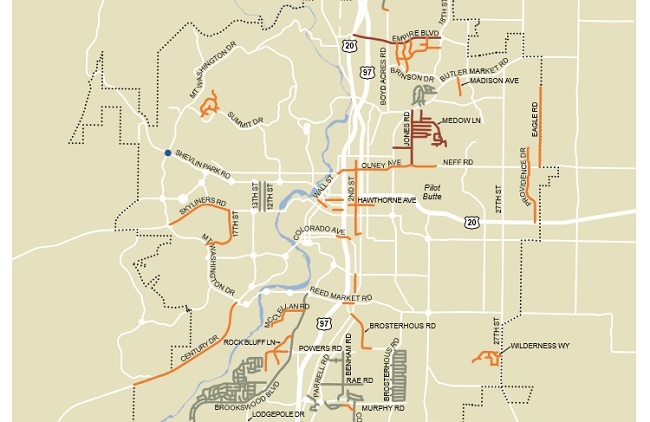 The public can weigh in on planning efforts at a scoping meeting scheduled for April 17, from 6:30 to 7:30 p.m. at Elk Meadow Elementary (60880 Brookswood Blvd. Bend). That input will be included in a draft watershed plan used to secure funding for the project. BEND, OR -- Deschutes County's County Community Development Department has a plan for the next fiscal year that outlines anticipated projects and goals requested by residents. Director Nick Lelack says the plan serves as a framework to solve major issues, "Our goal is to address affordable housing and a lot of major transportation projects." 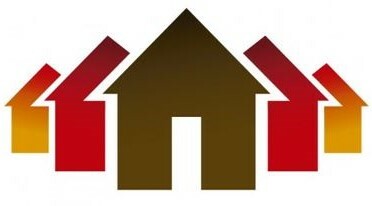 Lelack tells KBND News the plan is rewritten every year to address suggestions from residents, "The real key priorities this year are going to be addressing affordable housing, which includes working with the cities of Bend and Redmond on some pilot projects, and hopefully addressing rural accessory dwelling units. There's a whole slew of amendments to the county code that we're going to be talking about, and a lot of major transportation projects occurring in Tumalo, Terrebonne, and all of our cities." 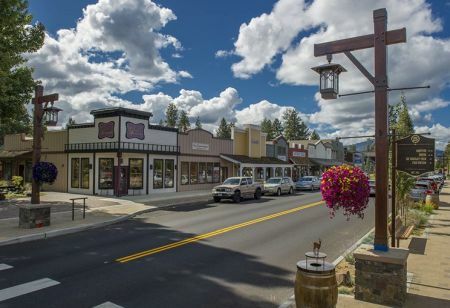 They'll also consider changes that could allow rural ADUs, if approved by the Legislature, "What we need to do is look at the avenues available to provide rural Accessory Swelling Units, or what can we do to support the cities of Bend or Redmond expand their urban Growth boundaries?" If state lawmakers clear the way for rural ADUs, zoning changes would be needed, "[There's] A proposal by the county to redesignate six residential areas that are currently zoned farm or forest to what they actually are, which is rural residential, and this will both streamline and lower the permitting costs for people that want to build a home on their properties." The public is invited to provide input as the plan is finalized at three open houses this month. Then, County Commissioners will vote to adopt the plan before July first. Click HERE to view the full draft plan. BEND, OR -- Portland tried out electric-scooter sharing last year and officials in that city plan to bring it back this spring. But, Bend City councilors are more hesitant to allow e-scooter sharing companies here. Jeff Munson, with Commute Options, says he's ridden them several times. 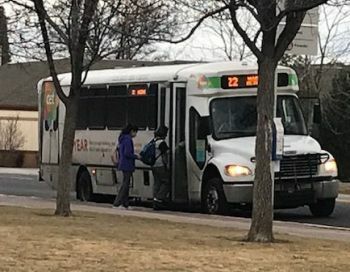 He believes e-scooter sharing could be a legitimate transit option for "the last mile" - that distance between where a bus rider is dropped off and their final destination. "They’re fun, they’re easy to park, I’d like to see a program come to Bend, maybe Redmond and other cities." Munson tells KBND News they're another way the city could ease downtown traffic congestion, "There’s questions about how much parking there is downtown and other issues with traffic, and so these e-scooters would make it a lot easier to get around on short trips. And, they’re really inexpensive; we could put e-scooters all around town." During last year's four-month pilot program in Portland, there were reports of scooters being left on sidewalks and blocking rights of way. Munson thinks problems in Portland were overblown, "There’s rumors about scooters thrown in the river, and I really don’t think that was widespread." Bend's City Council, this week, agreed to postpone allowing e-scooter sharing companies for at least another year, until regulations are developed. Munson says a similar bike-sharing program has been successful at OSU-Cascades, and he's disappointed scooters will have to wait, "I really don’t want to wait another year to roll these out. But, I guess the summer of 2020 might make sense when maybe there are some upgrades and the city is officially ready to roll these out with proper regulations, and that type of thing." He adds, "To be sure that this gets rolled out in the most correct way." Munson says the technology is constantly improving, along with the scooters themselves, so he thinks they'll be even better by the time they hit Bend streets. 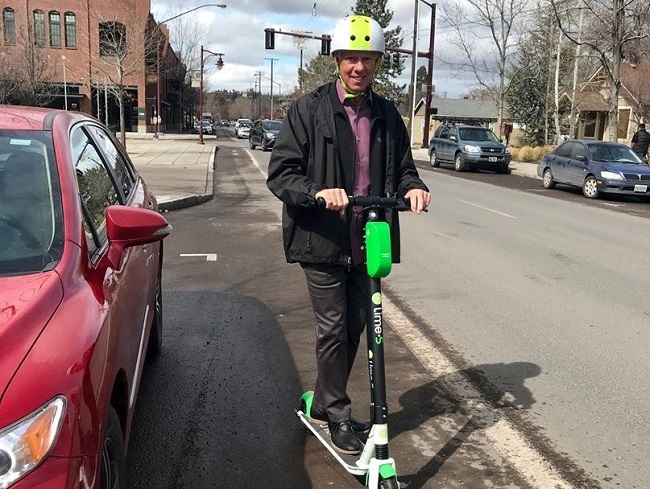 Photo courtesy of Commute Options: Executive Director Jeff Munson rides through Bend on a Lime electric scooter, Thursday. 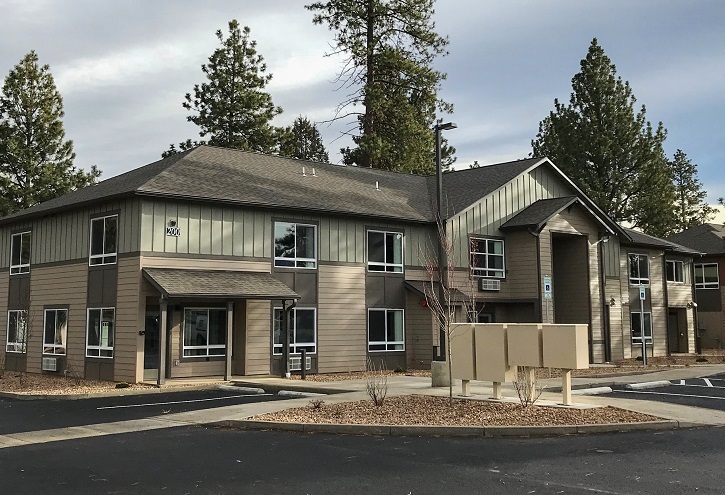 REDMOND, OR -- Affordable housing continues to be in high demand throughout Central Oregon, and Redmond is working to update is Comprehensive Housing Plan to determine how best to meet future needs. 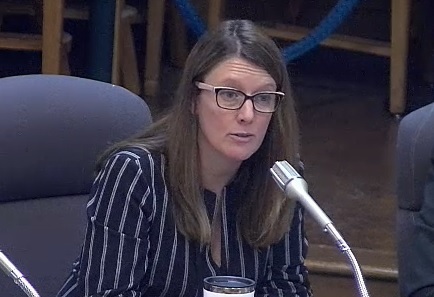 Redmond Planning Manager Deborah McMahon says the Department of Land Conservation and Development invited cities of about 30,000 people to get a "Housing Needs Analysis." 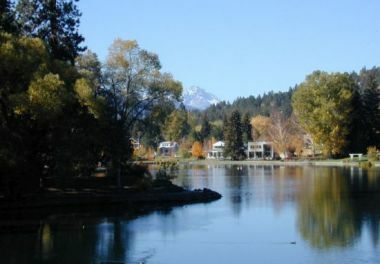 EcoNorthwest is now conducting that analysis, looking at the city's existing development plan, available land inventory and forecasted needs, "When the study is done, we'll know exactly how much acreage is required to accommodate those forecasted housing units," McMahon tells KBND News, "And what does that mean for Redmond? 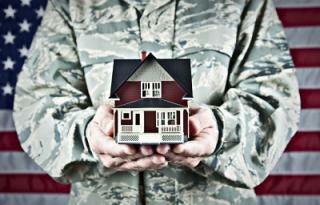 It probably means that some areas that are in the holding zone now need to be rezoned." 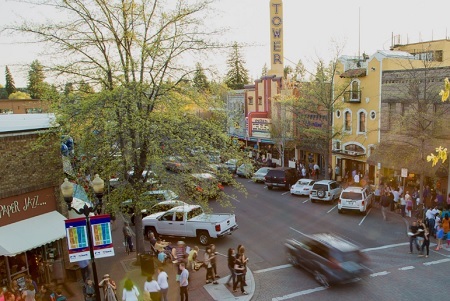 It's estimated Redmond will see nearly 17,500 new residents over the next 20 years. McMahon says that translates to a need for nearly 7,000 new homes, "Single family detached homes: we're looking for 4,200 new units there. 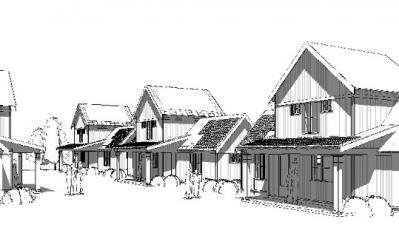 And then attached housing: so that's like townhomes, duplexes, triplexes, 4-plexes; we need about 1,000 of those units. And then just under 2,000 different types of apartments." Roughly 38% of Redmond's households are considered very or extremely low-income, and about 42% are low- to middle-income families. McMahon says that's why so many different types of homes are being proposed. The city's housing plan hasn't been updated since 2001, and McMahon says it's overdue. She believes this analysis will help the city do it right, "This is a really good overview of what our housing needs should be, particularly given the forecast in population." Redmond's Planning Commission will get an update on EcoNorthwest's work at its Monday meeting. 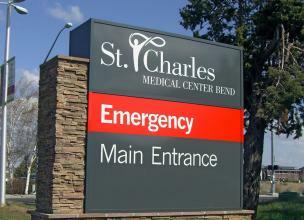 BEND, OR -- St. Charles Bend's Emergency department was forced to evacuate, earlier this week, after a small fire was discovered in a trash can. 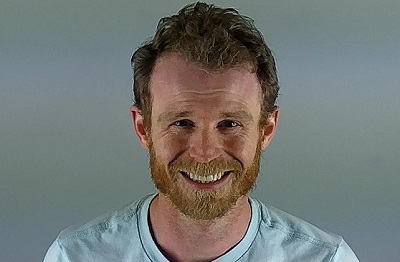 According to Bend Police, an officer opened the door to a consult room, Wednesday evening, and saw 35-year-old Henry Crall pouring hand sanitizer on the blaze. The officer tried to pull the trash can out of the room while a hospital volunteer grabbed a fire extinguisher, but authorities say the La Pine man continued to pour the liquid in to the can. The officer was able to put it out and no injuries were reported. Investigators Believe Crall used a lighter and hand sanitizer to start the fire. He's now charged with arson. SALEM, OR -- The 2019 legislative session has already seen its first "witching hour" deadline. Policy bills not scheduled for a committee work session by the end of last week are not allowed to advance. 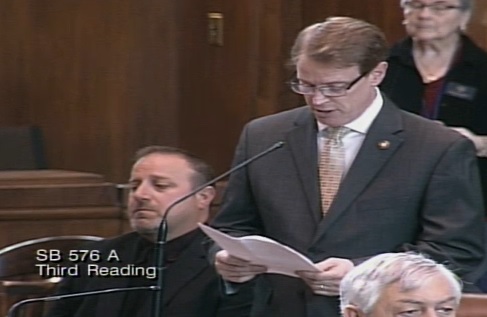 State Senator Tim Knopp (R-Bend) says he's disappointed his school threats bill didn't make the cut. It would have made it a felony to make a terroristic threat, "[It] just kind of died in the Judiciary Committee. So, we're going to have to continue the discussion on that, probably another session, because I think that's important to create more penalties for threats to students and teachers." He's also frustrated his fellow lawmakers failed to take action on PERS reform, "Some bills that we put in didn't make it through the process, which is unfortunate. Maybe those will get revived somewhere down the line, in Ways and Means. But, right now, those appear to be dead." Some of Knopp's top priorities survived the initial cut, "Kaylee's Law; [it's] really important to get that passed, and that's scheduled for a work session. The Redmond affordable housing bill is coming out of the Senate Housing Committee; I'm going to carry that on the floor next week. And then we have the workplace sexual harassment bill that I think we're going to get through the Senate committee." And, he plans to fight some bills that did make it into committee, especially those he thinks would damage Oregon's small business community, "There's some significant tax increases that, I think, are going to be unproductive for our economy, and for employees of small businesses." The next deadline is April ninth, when bills need to have been discussed in a work session, followed by voting deadline at the end of May. BEND, OR -- Four people face numerous charges in connection with drugs smuggled in to the Deschutes County Jail. Sergeant William Bailey says the investigation began in January, when authorities discovered inmate mail laced with Suboxone, hidden in the seams of manila envelopes, "Suboxone is typically prescribed by medical professionals to assist with detoxing from opioids. Suboxone can be abused and it is capable of producing a significant euphoric affect." He tells KBND News it's administered on thin strips of paper that melt on the tongue, "The Suboxone itself is a very thin, ribbon-type of material and so it was easily concealed within this thicker seam on the envelope." 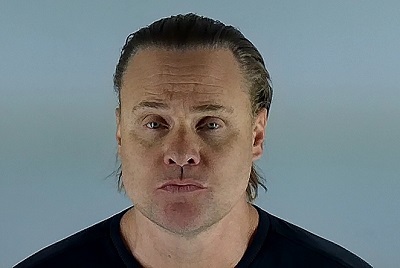 The Sheriff’s Office Street Crimes Unit began investigating in January, after the drug-laced mail was discovered, "This bottom seam was being opened up through either steam or other type of a heat process. 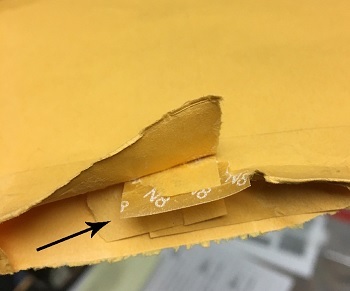 The controlled substance, in this case the Suboxone, was being concealed inside and then the envelope was being sealed back or glued back closed. So, it appeared, at first glance, that there had been no manipulation to the envelope." Sgt Bailey adds, "The investigation did find that there was a component of the controlled substance being used in the facility and sold. The investigation is still ongoing and we do anticipate more arrests." 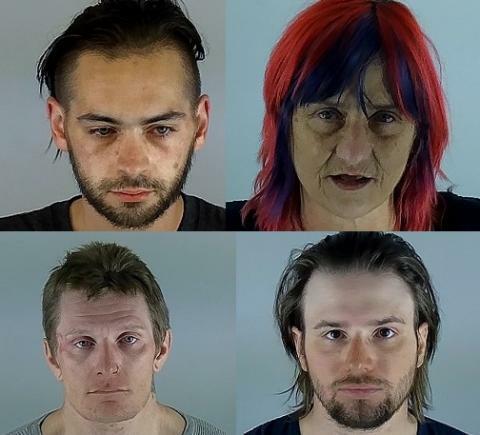 Deborah Anderson, a 58-year-old Portland woman, is accused of sending the drug to her inmate son, 29-year-old Phillip Anderson (pictured: upper left). She was arrested after a search of her southwest Portland home turned up meth, heroin and drug paraphernalia. 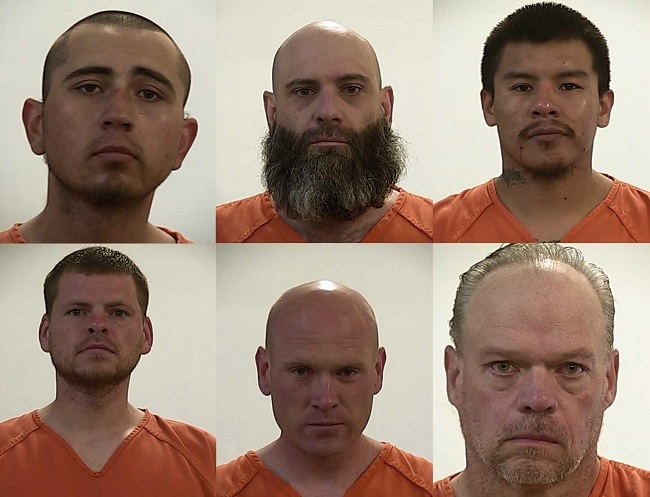 Another inmate, 32-year-old Derek Chamberlain (pictured: lower left), allegedly received his drug-laced mail from 29-year-old Zachary Hahn, of Bend (pictured: lower right). Sgt. Bailey says the four may have been working together in some capacity, "We do think that there was some training, or involvement, between the Anderson mother and son, and the other two parties." The case could lead to changes at the Deschutes County Jail, "Inmates are allowed to receive mail; the items are searched for contraband and weapons," says Sgt. Bailey, "But, criminal mindset was able to find a weakness and able to find a way to get this substance in and so we will have to make changes to prevent this from being utilized in the future." BEND, OR -- Bend's City Council approved a full slate of street preservation contracts for summer projects, Wednesday night, totaling more than $7 million. Over $5 million is for “grind-and-inlay” and overlay treatments for 50 lane miles, including Skyliner Road, Century Drive, Colorado Avenue and Olney-Penn-Neff. Officials say some of that work will be done at night to minimize traffic disruptions. Another $710,709 will go toward Slurry seal on about 60 lane miles, and crews will reconstruct the Shevlin Park and Mount Washington roundabout, at a cost of just over $824,000. 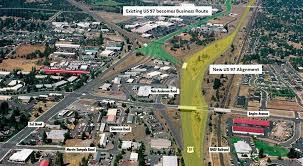 Council also authorized a joint venture with Deschutes County to chip-seal 15 lane miles around the city. 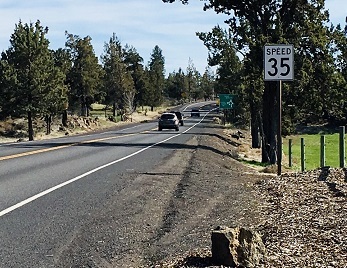 Bend's Streets and Operations Director, David Abbas, says there is a small shift toward work on residential roads because main streets are in better shape. For more on the projects and to view a map of the work planned for this summer, visit the city's Street Preservation webpage. SALEM, OR -- The name of a Bend Police officer was etched on to the state’s Fallen Law Enforcement Officer Memorial Wednesday, during an engraving ceremony in Salem. Bend PD’s Honor Guard stood watch (pictured above) as Sgt. John Lawrence was added. He suffered a fatal heart attack, in December 2014, following a shift in which he responded to a bank robbery. His death is considered “in the line of duty” because the heart attack occurred less than 24 hours after engaging in an on-duty situation. Lawrence was a 10 year veteran of the department. A formal memorial scheduled for May 7th will honor all four names added to the monument this year. In addition to Sgt. Lawrence, Ashland Police Officer Malcus Williams - who suffered a fatal medical event while on a call in March 2018, Multnomah County Deputies Irving Burkett and Robert Ray "Bobby" Anderson were also added. Anderson was shot by a suspect in 1969 and was forced to retire; Burkett was shot during a jailbreak attempt in 1982 and also retired as a result of his injuries. The four join Oregon's 183 other law enforcement officers who have died in the line of duty since the 1880s. SISTERS, OR -- A popular attraction outside Sisters is getting an upgrade this summer. Kassidy Kern, with the Forest Service, says they’re in the process of bringing on a new group of volunteers at the Dee Wright Observatory, "We want to do some roving interpretive tours on the whole site, so that all of the people who come up and visit it will be able to get a little bit more of the history of the area, be able to interact." Many other USFS sites have volunteer interprative rangers, but the Dee Wright Observatory never has, Kern says, partly due to its remote location. She says volunteers will be trained to answer questions about the unique observatory, located about 15 miles west of Sisters, on Old McKenzie Highway, "It was hand built from black lava in 1934 and ’35 by the Civilian Conservation Corps, and it was named for the foreman Dee Wright who passed away, actually, before it was completed. He was a packer for the Forest Service; a very well-loved individual." 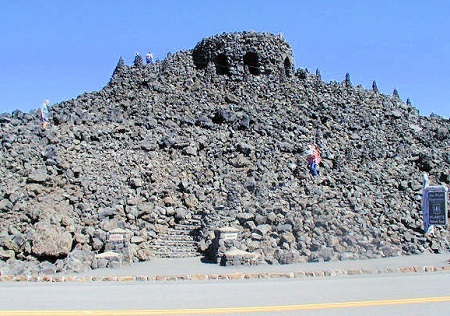 They'll also be able to talk about the geology surrounding the site, "It’s surrounded by 65 square miles of lava. The top deck offers views of 16 mountains and Oregon’s second largest glacier. So, there’s so much to talk about even within those elements." Kern tells KBND News, "We do get a lot of visitors. It’s a beautiful area; that whole drive is really lovely and so, it allows people to stop and stretch their legs, learn a little bit about the unique geology of Central Oregon and all of the volcanoes along the Cascade Crest." 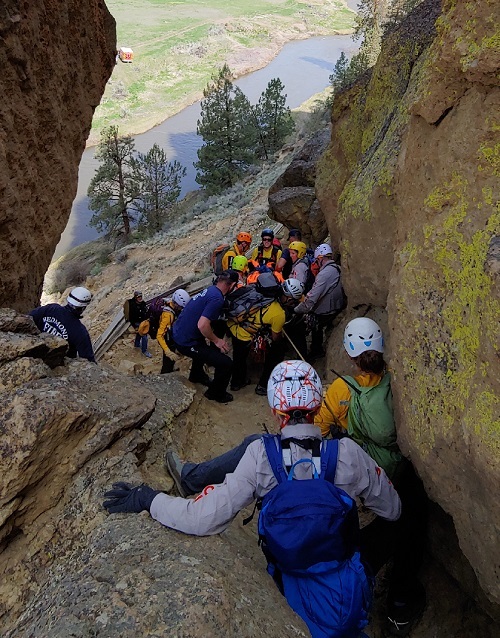 If you’re interested in becoming a volunteer interpretive ranger, attend the Sisters Ranger District open house, April 11, 5 - 7 p.m., at the Sisters Fire Hall on Elm Street. 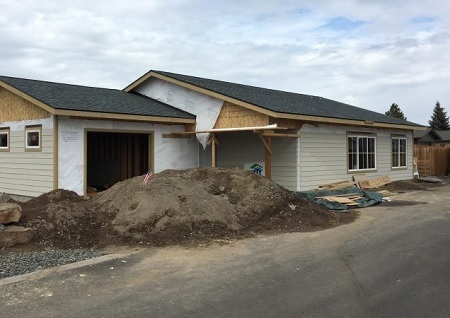 BEND, OR -- Habitat for Humanity offices in Bend and Redmond are merging, in an effort to increase access to affordable housing for low to moderate income families. 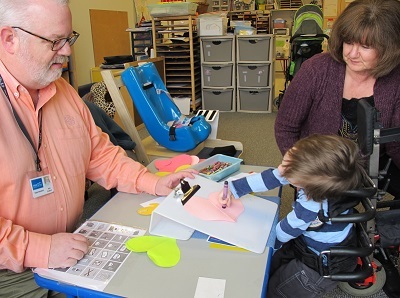 Bend Habitat's Robin Cooper Engle says the Redmond organization had smaller staff who didn't have access to the same program available to Bend. Yet, she says, Redmond's Habitat office gets more requests from families than houses it can build, until now, "There are some opportunities for folks: maybe the cost makes more sense, maybe the land makes more sense, there's still quite a bit more land available in Redmond. [It] Definitely increases the opportunities." Cooper Engle believes joining forces will allow both groups to grow, "When we started, we were probably serving a couple of families a year, and that's not enough. We're doing good work, but you want to do more; you always want to do more. And so, the opportunity presented itself that we could also be helping Redmond. If we can go from serving one to two families, to quickly jumping to five within this first year, that would be incredible." She tells KBND News, "So this year, [Bend] will serve about 10 families through home ownership. Our goal is to completely double the capacity between the two communities. 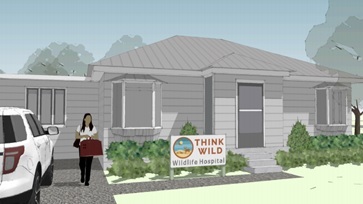 So, our hope is to be serving 20 families, between Bend and Redmond, within this next year." Habitat For Humanity always needs volunteers who want to learn about building. Cooper Engle says they especially need people in Redmond, since the merger will create more opportunities in that area. Visit the new Bend-Redmond Habitat website for more information. 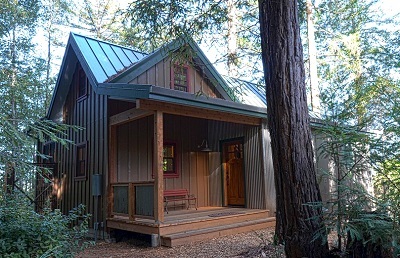 BEND, OR -- Under current state law, Accessory Dwelling Units (ADUs), sometimes called "granny flats" or "tiny homes," are not allowed on rural properties. But, that would change under a bill currently being discussed in Salem. "It would allow a second home on parcels of two acres or larger in the rural county – Rural Residential parcels. 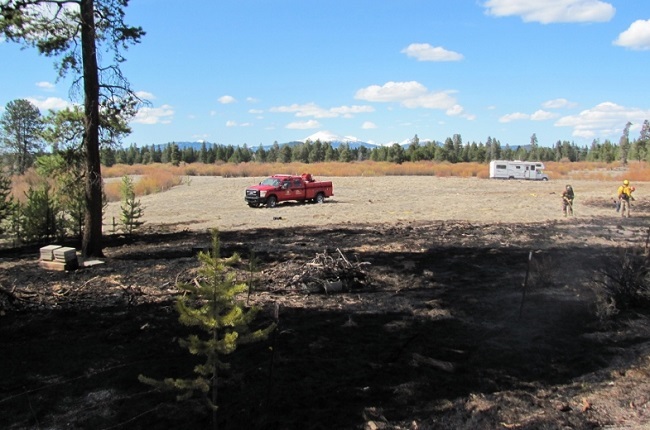 So, not EFU [Exclusive Farm Use], but MUA-10 [Multi-Use Agricultural] and Rural Residential-style parcels," Deschutes County Commissioner Tony DeBone tells KBND News. He and the other Commissioners are closely watching the progress of Senate Bill 88, "It would help the housing crisis; would help rural landowners that could have an opportunity to put a second dwelling on it, either for rental or for family members. So, there are lots of reasons it would work in Deschutes County, even." 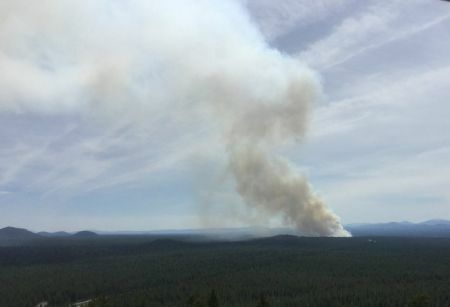 DeBone is concerned how, or if, lawmakers will limit ADUs in Wildfire Hazard Zones, "If ‘Wildfire Hazard Zone’ is defined as somewhere that’s forested and has a history of wildfire, it might disqualify most or all of Deschutes County." Central Oregon LandWatch opposes the bill, saying it could put a strain on rural infrastructure and doesn't get residents close to services. They support ADUs inside Urban Growth Boundaries. DeBone says it's time to think beyond the UGB, "It’s the vision of statewide land use from way back in the day ‘put the people in an Urban Growth Boundary and farm in the rural county.’ But, there are places around the state - and Deschutes County, specifically – we were parcelized before all that went in. As in, land was subdivided in the ‘50s, ‘60s and 70s. It is kind of a rural residential feeling in some areas in Deschutes County, so it’s a good fit." The Senate Committee on Environment and Natural Resources advanced the bill during a Tuesday work session, sending it to Ways and Means for consideration. MADRAS, OR -- Rural land considered unusable for agriculture is finding new purpose in the solar industry. Two new solar farm projects are in the works for the High Desert. A 60-megawatt project is proposed for west of Madras. Nathan Rogers is with EcoPlexus, a global solar company designing the project. 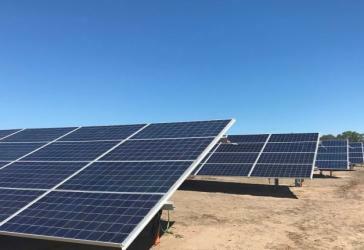 He tells KBND News, "Solar is a very hot topic of conversation right now in Oregon, especially in relation to land use and whether solar should be going on farm land or not going on farm land." Rogers believes the Jefferson County location is perfect for a new solar farm, "It is largely tabletop flat and the site doesn't have any water rights, so it's not a good site for farming. It also has the ability to interconnect or to hook up to the grid, on site. Also, Central Oregon has very good solar radiance, or solar resource. Where it's located on the grid, it's a good spot in terms of power quality. It can basically provide lots of grid support." It would join two 10-megawatt farms already running in Jefferson County. 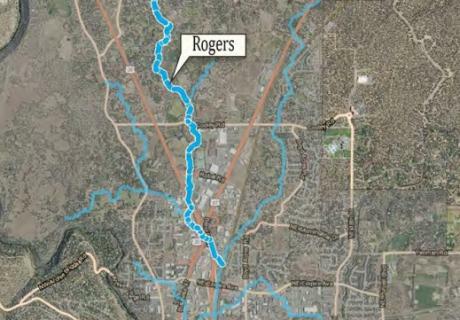 EcoPlexus submitted a notice of intent for the project, and Rogers will discuss the process with Jefferson County Commissioners on Wednesday. "The way that the laws are set up in Oregon, if your project exceeds certain size thresholds, the county can't issue your permit. You have to seek what's called a site certificate from the Energy Facilities Siting Council." Rogers plans to also present a formal project preview, "This will be a great opportunity, if anyone is interested to learn more, to come and do so." He adds, "We like to develop relationships in the places that we are working and developing projects, and so I thought it would be nice to just present a little bit about the project to the board." A second proposal is also moving forward in the High Desert. The Crook County Planning Commission recently approved a 320-acre solar farm near Prineville. Like the Madras-area project, the West Prineville Solar Farm will be built on EFU land with no irrigation or water rights. Crook County Judge Seth Crawford tells KBND News he sees solar as a positive for the community. County leaders have actively tried to recruit solar projects to the area in recent years. MADRAS, OR -- A Madras man is recovering after he was stabbed at a home in the 500 block of Southeast 10th Street. 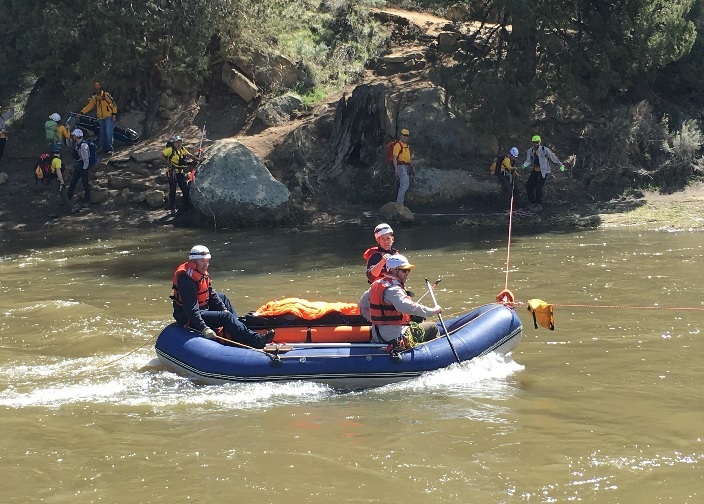 Madras Police responded to the house at about 12:30 p.m. Tuesday, and found the 50-year-old victim with a puncture wound in his neck. He told officers he was visiting an acquaintance when he was attacked by 21-year-old Benjamin Bunnell, also of Madras. The victim was taken to St. Charles Madras with non-life threatening injuries. Bunnell was arrested and is scheduled to be arraigned on First and Second Degree Assault and Unlawful Use of a Weapon charges, Wednesday. 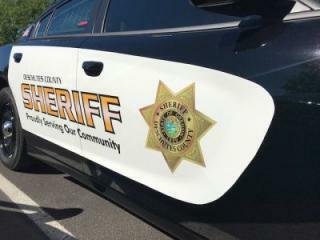 BEND, OR -- A California woman was arrested on multiple charges, north of Bend, early Tuesday morning. 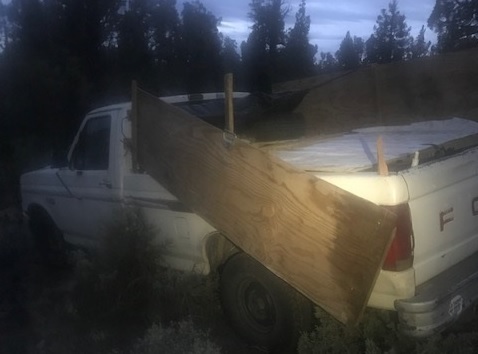 According to Bend Police, 66-year-old Larklyn Blunck was seen swerving "all over the roadway" on Highway 97 near Empire, at about 5:30 a.m. Officers found the Silver Nissan Rogue and attempted to pull it over, but the driver didn't stop. They pursued the car northbound, but authorities say speeds did not exceed 60 mph. 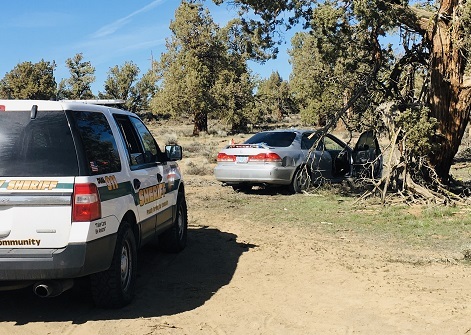 Deschutes County Sheriff's deputies deployed spike strips to deflate Blunck's tires, but she continued. Deputies then conducted a PIT maneuver on Highway 97 near SW Quarry Avenue. Blunck was arrested for Driving Under the Influence, Attempting to Elude, Reckless Endangering and Reckless Driving. BEND, OR -- Doctors at St. Charles Bend put a new robot to work in its first surgical procedure, Monday. It's an updated version of the Da Vinci platform the hospital has used for robotic surgery for several years. Dr. Phuong Nguyen says the technology doesn’t replace his surgical ability, but it’s less invasive. 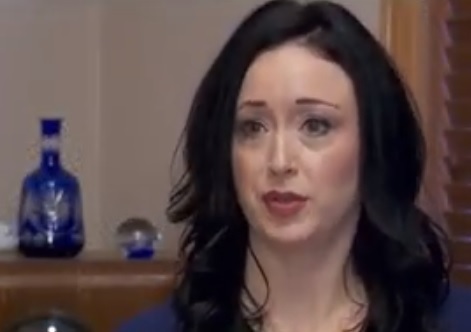 "Instead of a large incision, I’m able to do the same surgeries with multiple small incisions. And, these incisions are about the size of the tip of my finger. And we’re able to do, not only the same surgeries, but, in my opinion, better surgery. Because of the robotic platform, there’s more dexterity and there’s high precision." A tiny camera is inserted through one incision, with the instruments in the others. 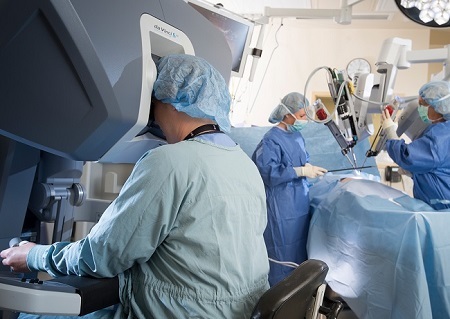 He admits some patients are a little nervous about robotic surgery, until he explains the surgeon is nearby, "The robot is controlled by me while I’m sitting inside a console, approximately six-feet away from the patient." Dr. Nguyen tells KBND News the process is a little like playing a very expensive video game, "You have a head mask that you wear that gives you a 360-degree, three-dimensional view of the patient’s abdomen, and you have hand controls and foot controls. So, you’re literally using your entire body at the same time, controlling the robot. And, every movement that I make with my hand, the robot is doing the same movement inside the body." The Da Vinci robot previously used at the Bend hospital will be moved to St. Charles Redmond. "This is very exciting for, particularly, surgeons like me," says Dr. Nguyen, "because I don’t only perform surgeries in Bend. I also cover the northern campuses. To have a robotics program instituted up there, it’s going to be very good for those patients up there." He believes it will help ease scheduling, and allow residents to stay closer to home instead of having to go to Bend for their surgery. File Photo courtesy of Intuitive, maker of the Da Vinci surgical robot. SALEM, OR -- Oregon's new Secretary of State Bev Clarno worked her first full day Monday and dismissed three top executives in her office. According to the Associated Press, Chief of Staff Deb Royal was let go, along with Deputy Secretary of State Leslie Cummings and Governmental and Legal Affairs Director Steve Elzinga. Clarno's office calls the staffing transitions "personnel matters," and refused to comment further. Calls from KBND News were not returned. The former lawmaker was sworn in Sunday at her home in Redmond; an official ceremony is planned for later this week. Clarno succeeds Secretary of State Dennis Richardson, who died of Brain cancer in February. 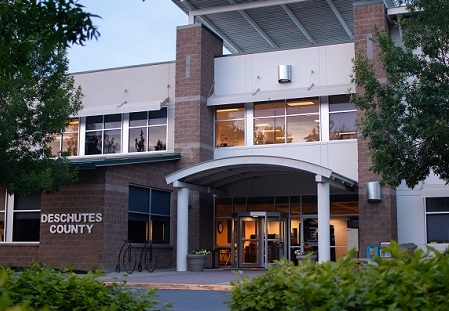 BEND, OR -- Deschutes County could soon be able to borrow money at a better interest rate, thanks to a higher credit rating from Moody's Investors Services, a national bond credit assessment agency. County Finance Director and Treasurer Wayne Lowry says the rate went from Aa2 to Aa1 because of several favorable factors, "The tax rate capacity; Real Market Values in Central Oregon are increasing and have been for some time; community wealth factors, in other words, the citizens income per capita, and that's higher here than it is in a lot of other places. 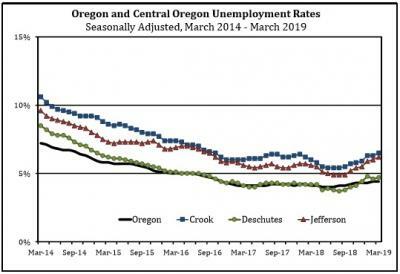 And, that makes Deschutes County a better credit risk than maybe some other local governments." He says the county also doesn't owe the market a lot, "We have a low debt burden already. We've been able to do a lot of what the county's done without borrowing." Lowry tells KBND News, "It's hard to quantify exactly how much the county would save being a Aa1, instead of Aa2, but it is cheaper to borrow money for projects: road projects, solid waste projects, things like that." He says it's recognition of the smart choices the county has made as it grows, diversifying the economy and employing conservative policy management, "The ratings agencies have recognized that 'Hey, Deschutes isn't just any county in Oregon, it's different than it used to be, and it's stronger, financially, than it ever has been'." County Commissioners will discuss the new bond assessment rating at their Wednesday meeting, and its impact on future decisions. 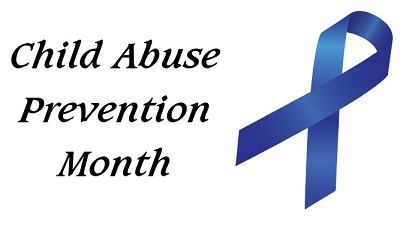 BEND, OR -- Two local child-abuse prevention agencies kicked off their annual Blue Ribbon Campaign, yesterday, as part of a nationwide, month-long awareness effort. Rachel Visser, with the KIDS Center, says you can show support by wearing a blue ribbon or attending one of the educational opportunities scheduled throughout the region, "To let people know that child abuse just isn’t a big city issue or something that’s kind of on the periphery. 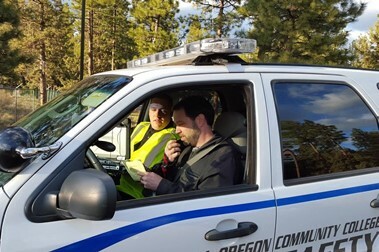 But, it’s very much a community issue; it’s something that Central Oregon deals with." There were more than 4,000 reports of child abuse or neglect in Central Oregon in 2017. Visser tells KBND News they do what they can to help victims, but the goal is to prevent abuse before it happens. "We have direct client services. So, if there’s a kiddo that is in a situation of abuse or suspected abuse, we’re able to come alongside that family and provide resources for them. 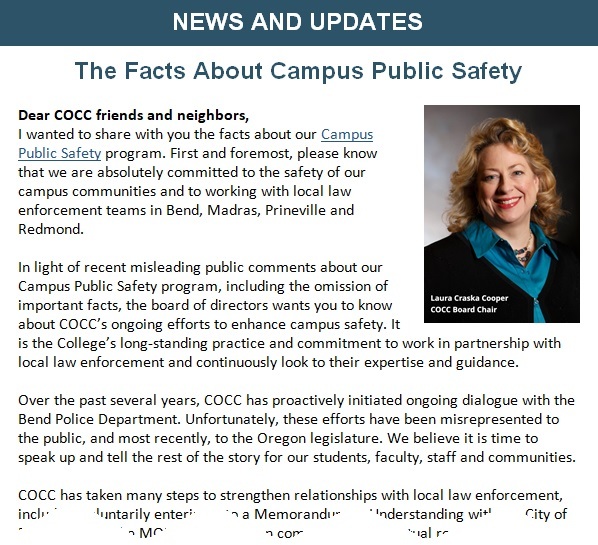 But, what we’re hoping to do is before that family gets into that position, or before that kid gets into that position, is to educate adults about how to create a safer community." 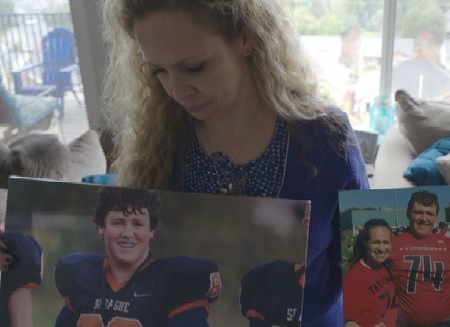 The Blue Ribbon Campaign started 30 years ago in Virginia, when a woman tied a blue ribbon on her car antenna to symbolize her grandson’s bruises, after he died at the hands of his mother’s abusive partner. "We want to be able to grab people’s attention," says Visser, "and then be able to educate and help them learn how to prevent this in the future." The KIDS Center and MountainStar Family Relief Nursery are working together on the Blue Ribbon Campaign. For more information, including trainings and other events throughout the tri-county area in April, click HERE. 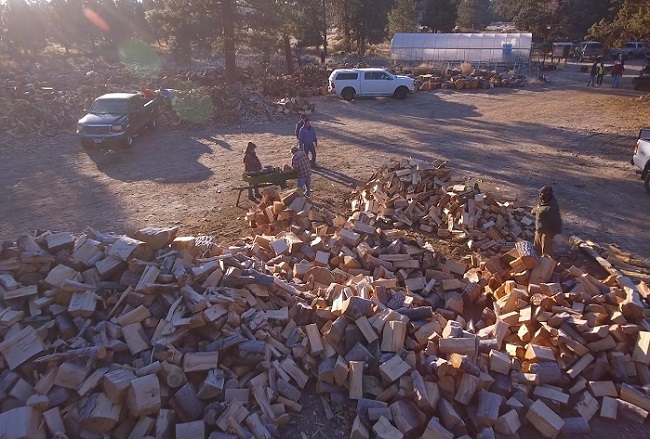 BEND, OR -- A Bend-based nonprofit recently received a massive donation of logs and they need volunteers to help split and sort the wood for needy families. Richard Berg, manager of the Nativity Wood Lot, says they've been providing firewood since 2005 and in the past month, they've seen record demand, "We've had 140 families come through over a three Saturday period, and that equaled 38 cords of wood that went out the door to keep families warm." Which, he says, is why it's important to get this latest donation of wood ready for families as quickly as possible. "We've had a lot of cooperation lately. There's been 1,000-cord donation given to us, and that's going to keep us supplied with wood for a number of years. We can use 25-30 volunteers every single Saturday to process it here and distribute it to the families." Berg says the latest donation came from a local doctor who supports their mission. There's another donation ready to come in, but he says there isn't room to store it until the other is taken care of. And, Berg says, they've been operating on J.L. Ward property that will soon become the location of Bend's new high school, so they also need to find a new location. Berg tells KBND News, the effort is about forming relationships with the people they help, "As people come through the gate to get wood, we can't charge them anything, but we ask if they're able to give us a donation. And almost everybody says, 'Oh, Absolutely! Because if it wasn't for this thing being here, I wouldn't have heat in the winter time'." Nativity Wood Lot is open every Saturday morning for volunteers and those in need of wood to heat their home. To learn more, visit Nativity Wood Lot on Facebook. REDMOND, OR -- Governor Kate Brown has appointed a former state legislator from Redmond to Secretary of State. Bev Clarno served as Speaker of the House, Senate Republican Leader and was appointed by President George W. Bush to the regional office of the US Department of Health and Human Services. Brown says Clarno’s experience as a lawmaker and manager of a large government organization gives her the skills to oversee the Secretary of State’s Office. Clarno says there isn’t a Republican or Democrat way to oversee elections or state audits - only the honest way. 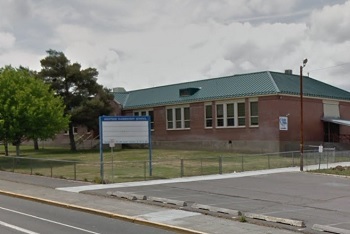 MADRAS, OR -- The old Westside school in downtown Madras could get new life under a new proposal. Built in 1938 as Madras Union High, the building on SW Fourth later served as Westside Elementary, until it closed in 2009. "It’s the old Westside High School that’s been used for an elementary school, and it’s an old building," Madras Mayor Richard Ladeby tells KBND News, "We’re talking about trying to turn that into a community center and house the historical museum in there; also, the library is going to be a part of that venture." The Jefferson County Historical Museum was located for years in the old county courthouse. but its collection has been in storage since 2012. The downtown building is already home to the Jefferson County Kids Club after-school program, "We, right now, average about 150 kids a day, Monday through Friday; so, it’s a great asset to our town. That would stay," says Ladeby. "But, then we’re also looking at adding other entities in there. Right now, we haven’t come up with any set plan of who, but we’ll have a kitchen in there, dining areas; we’re looking at two basketball courts or gymnasiums." He's optimistic others will come on board to support the project and move it forward. 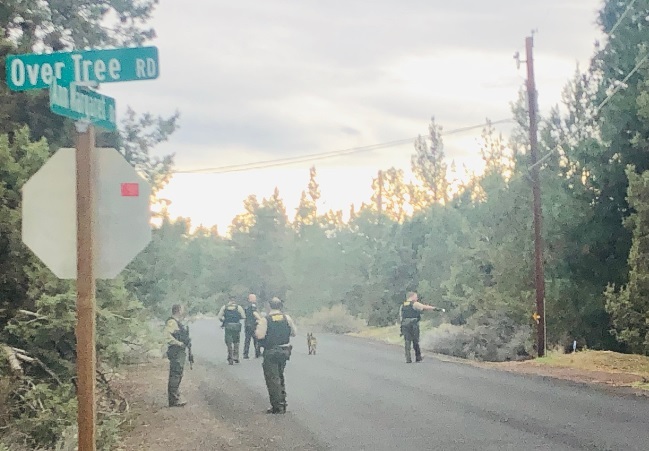 BEND, OR -- A 71-year-old Bend man reported missing Sunday night was found by police who used a drone and K-9 team during the three-hour search. A family member told authorities Raymond Biggs had last been seen around 7:15 p.m. near 27th and Forum Drive. A citizen tip led police north, where they discovered his walker and other personal property near NE 27th and Wichita Way. Officers finally found Biggs near Mary Rose Place, at about 10:20 p.m. He apparently had harmed himself and was taken to St. Charles Bend. His current condition has not been released.